The first sequel comes twelve years after the original, but will the cannibal family still appeal to the audience’s palate? When a law enforcer with a personal interest in the mysterious chainsaw killings arrives in Dallas, a local DJ helps him find the family of misfits in an attempt to end a horrific string of murders. The head of the cannibal family, Drayton Sawyer is shown winning a cooking competition where his secret of success is, ‘Don’t skimp on the meat,’ – leading to a woman picks a human tooth out of her food. This public display of the cannibal killer as a beloved local saint is a clever transition from the previous film’s portrayal of Drayton and makes him much more disturbing. However, this angle is short lived in early scenes before he becomes confined to the family abode. The inclusion of Dennis Hopper as Lieutenant ‘Lefty’ Enright brings about a major change in the franchise with Lefty wanting to investigate the killings rather than act as a traditional victim of them, ‘They live on fear; they thrive on it. I ain’t got no fear left.’ Hopper plays Lefty as a confident, intelligent all-American hero and easily matches, the main villain, Leatherface. He’s also an entertaining inclusion to the film, but his lack of fear makes the horror aspects an impossible up-hill battle. Leatherface himself comes across as reasonably comic, repeatedly shaking his bum while waving a chainsaw above his head. However, he does become more interesting when a female character, Stretch, manages to partially control him. A weird scene of him placing a newly cut human face on Stretch’s own face and making her dance with him is both freakish and comic; however, due to Leatherface’s playful physicality, any potential shock factor will be lost on true horror fans. Whereas the first film never actually showed any real gore, this film is decidedly gorier with a head being cut in half, a carving knife cutting sheets of skin and even a man with his face cut off staring at the woman who’s wearing it. All of this amplifies the film’s violence and turns the film into a comedic gore fest that undoubtedly horror and gore fans will enjoy. However, fans of truly scary and unnerving traditional horror will be disappointed with the gore and unexpected action elements overtaking them. 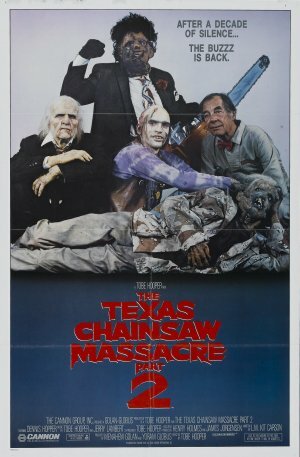 The Texas Chainsaw Massacre 2 delivers a great deal of bizarre and shocking moments but doesn’t come close to bringing the terror and believability of the first film’s action and its characters.